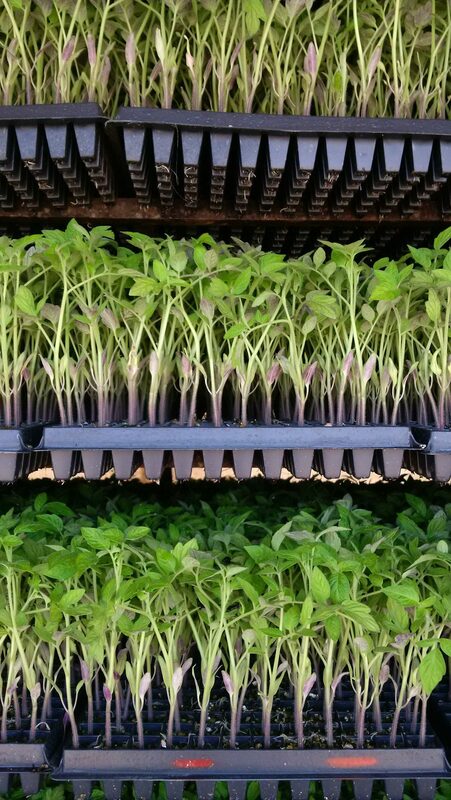 Healthy and hardy transplants are a critical part of a successful season. When field planting is delayed by rain, rain, rain, or cold weather and plug transplants must be held, it is important to monitor them closely to maintain plant health and vigour. Plug transplants can be held in the greenhouse but if already shipped to the field grower, can be stored outside, in an area that receives direct sunlight and is sheltered from the wind. The racks should be elevated to prevent root growth through the bottom of the plugs. If there is a risk of frost, be sure to bring the transplants inside – to a building, a shed, or a greenhouse/hoophouse, if you have one available. Plants should not generally be stored in an enclosed trailer or building for more than 1 or 2 days, as this may result in very soft, elongated plants, especially in crops such as tomatoes. The plants should be checked throughout the day, and watered regularly, never allowing the plugs to dry out. It is best to water the plants thoroughly in the morning, then spot water dry areas in mid-afternoon. Transplants should not be watered heavily late in the day, as this may promote disease (due to extended periods of leaf wetness), realizing however that those held outside may be subject to late day watering by rain. If planting is delayed longer than 5 to 7 days and the transplants begin to show nutrient deficiency symptoms, they can be fertilized with a soluble fertilizer that is low in phosphorus and ammonium nitrogen (eg. 14-0-14 or 12-2-13). This can be applied in water, mixing according to the manufacturer’s directions. The solution may be applied over the plants with the sprinkler wand or using a dip tank. Take care not to overfertilize. If plants are stacked, as in a trailer, it’s preferable not to water them in the stack. Water dripping from upper racks to lower racks is a very effective way to spread disease organisms. When clipping onion transplants, clean and disinfect the blades as often as possible to prevent the spread of bacterial disease. Disinfection will only be effective if all organic material is first removed from the equipment surfaces. It is not recommended to trim any other transplant vegetables. Research has shown that, if properly stored, tomato transplants can be held for up to two weeks with little reduction in plant stand or vigour.